After several years of development, the The Happytime Murders is finally moving forward in the right direction. The Jim Henson Company and STX Entertainment are in early talks with actor Jamie Foxx to star in this comedy, which will be R-rated and feature a blend of live-action and brand new muppet characters. STX hasn't issued a release date for the unconventional comedy at this time, and it isn't known when production may begin. The Happytime Murders is set in a city where humans and puppets co-exist. Some of the biggest celebrities in the world are the stars of a hit TV series entitled The Happytime Gang. But behind-the-scenes, these stars lead horrifying lives that don't exactly match their family-friendly on-camera personas. When the stars of this show start getting killed off in gruesome ways, two LAPD detectives must put their differences aside to solve the case. 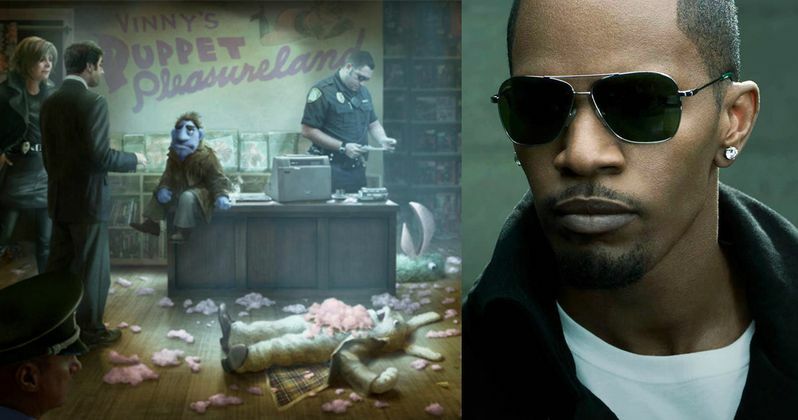 According to Deadline, Jamie Foxx will play Detective Edwards, a straight-laced cop who must team up with his old partner, a hard-drinking womanizing puppet named Phil, who has a connection to one of the victims. Phil isn't terribly fond of Edwards' squeaky-clean attitude, as they try to put this killer behind bars before they end up killing each other. The project will also present a number of lucrative merchandising and licensing opportunities for The Jim Henson Company. Brian Henson, son of the late Jim Henson, is directing from a script by Todd Berger & Dee Robertson}, and Erich & Jon Hoeber (Red, Red 2). This project has been in the works for several years, with Katherine Heigl once attached to star back in 2012 in an unspecified role, although it isn't known if she is still involved in the project. The Happytime Murders brings Jamie Foxx back into the comedy realm. Jamie Foxx will next be seen in Sleepless Night alongside Michelle Monaghan, which doesn't have a release date in place yet. He also plays Little John in next year's Robin Hood: Origins, and he is currently filming Baby Driver, the next film from director Edgar Wright. We'll keep you posted with more updates on The Happytime Murders as soon as we have more details.